All pipes and fittings should be carefully inspected on delivery and before being used. No broken or defective pipe should be used. Cleanliness is essential to ensure a watertight joint. The spigot and the socket of all joints must be cleaned. The rubber gasket should be placed in the correct position. Under no circumstances should a lubricant be used with Lamell rings. A check must be made that the rubbers are evenly tensioned and not twisted. The vertical and horizontal alignment of the pipe must be correct before the joint is made. Piping should start at the downstream end, the pipes being normally laid with the sockets upstream. The spigot must be first entered into the socket of the preceding pipe; a suitable jointing harness should then be attached to the two pipes, which are drawn together until the pipe locks home. Prior to the pipe being fitted into its final position all gaskets should be checked to ensure twisting has not occurred. If the alignment of the pipe has been altered the pipes may need to be pushed together again. Adherence to the basic principles of pipe handling will do much to ensure a sound and efficient pipeline. Avoid damage when handling, especially to the ends of concrete pipes, and NEVER drag or roll pipes over rough ground. Use correct craneage for offloading utilising properly constructed ‘C’ hooks with spreader bar or canvass/fabric slings with central lift. Stack pipes on even ground on timbers to protect sockets and spigots, making sure the bottom row is securely chocked. Joint rings MUST be stored away from sunlight, heat or possible contact with any oils. Under NO circumstances should pipes be lifted by passing ropes or chains through the bores. 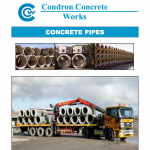 Ensure compliance with the Health & Safety at Work Act 1989, subsequent amendments and the Health & Safety Product Data Sheet issued by Condron Concrete Works in compliance with of the above act. Note: Chamber Rings and manhole Rings should never be stored on their side (“on the roll”) but should always be stored Vertically. This is particularly important with shallow depth sections, which are easily toppled even if stacked on firm, level ground.